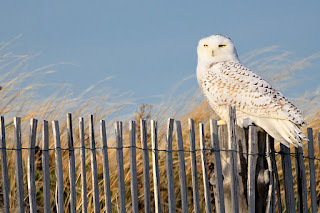 Approaching a snowy owl is tricky business. Too fast, too tall, too excited, too close translates to stressed owls and missed photo opportunities. All of us have our own comfort levels. Owls are no different. Imagine how comfortable you might be if you had a member of the paparazzi aiming his camera at you. If he is far away, you might not be bothered by the intrusion. But imagine him rushing at you, firing away. How close will you allow him to get before you either confront him or run away? Now imagine that you are sunbathing on the beach. Then 5 photographers quietly crawl towards you on their stomachs, until they are 50 feet to your left. They keep snapping your photo, but they aren't really bothering you too much. Still, its kind of creepy right? The 5 photographers spend over an hour, firing multiple machine gun like shots each time you make the slightest movement. Then 7 more photographers arrive on your right, shouting and pointing and running right at you. Are you still feeling comfortable? Most of us would have packed up our beach towel and picnic basket as soon as the first group of photographers tried to sneak up on us. A few of us might have called the police and the rest might actually enjoy having their picture taken. 1. Stay low. 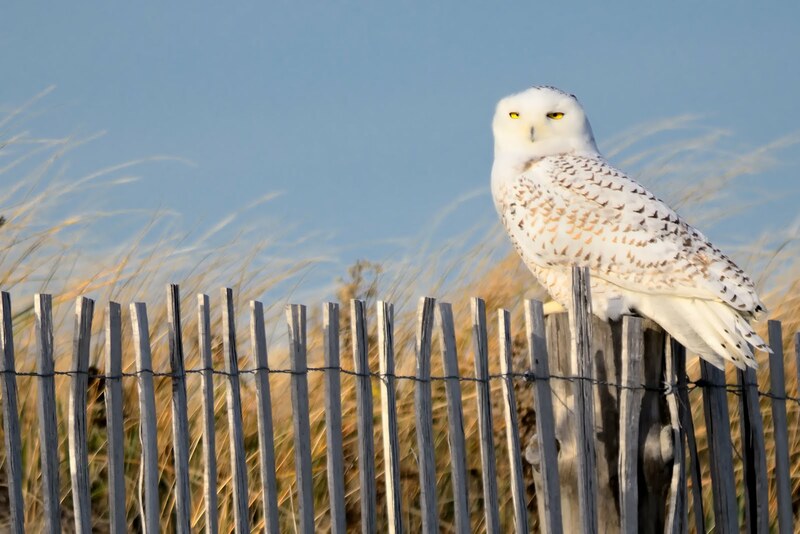 Snowy owls tend to stay relatively close to the ground, but they do like to be higher up than the rest of the creatures in their neighborhood. Crouch down until you are approximately 150-200 feet away from the owl. Then sit on your bum to slowly go the rest of the distance. If you can, you might try the good old belly crawl to approach the owl. At the very least kneel and crawl on all fours. 2. Move slow. The slower you approach an owl the better. 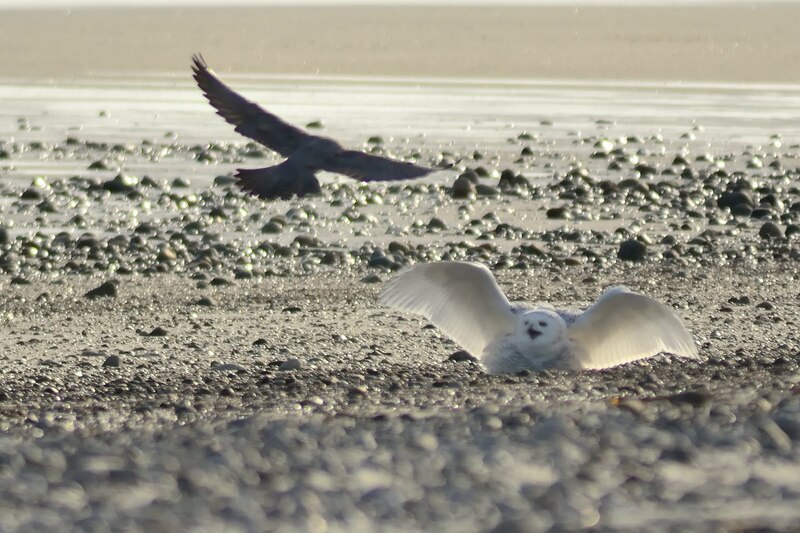 When you come in for a fast landing, the owl has to quickly decide whether you mean to harm it or not. If you move slowly, this gives the owl more time to get used to you. In addition to moving slowly, stop every few feet to take a few shots. This allows the owl to hear you taking the photos and hopefully get used to all of those strange clicking noises. 3. Keep your distance. Owls need their space. Stay at least 50 feet away from them. 4. Stay quiet. The more noise you make, the less comfortable the owl will be. Owls have fantastic hearing. While you think that you are quietly whispering, they are clearly hearing every word. Even at a great distance. 5. Be patient. 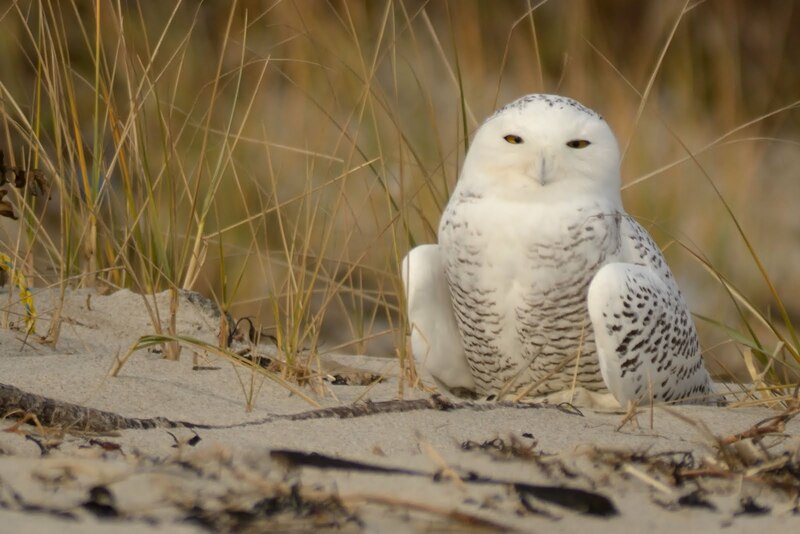 Snowy owls often like to sit in one place for a very long time. Sometimes hours. Eventually the owl will do something interesting. Just wait for it... In the mean time, please don't call to the owl or try to flush it to get a flight shot. 6. Do not bait the owls. Do not use food of any type to attract an owl closer to you. Baiting is bad for the owls. 7. Try to approach the owl with the sun at your back. This will allow you to be on the "right" side of the light. This means that the owl will be well lit and not have its face in shadow and the background will be pleasant rather than harsh, blinding light. 8. Stay out of off limits areas. Owls will sometimes be in restricted areas. These areas are restricted for a reason. If the signs clearly say "Do not walk on the dunes", please don't walk on the dunes. Even if it means missing the shot. Even if no one is around. It only takes one person to ruin it for everyone. 9. Last, but not least, watch the owl's behavior. If it seems nervous or agitated, do not approach any closer. The goal is to be able to view the owl without disturbing it. I hope you find these tips helpful. 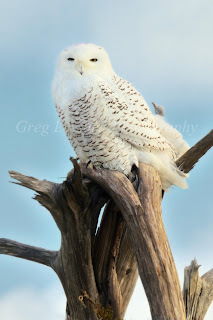 Please keep the owls' safety and comfort as your first priority when photographing them. Yesterday was another exciting day photographing snowy owls. This image was made when the owl decided to relocate. 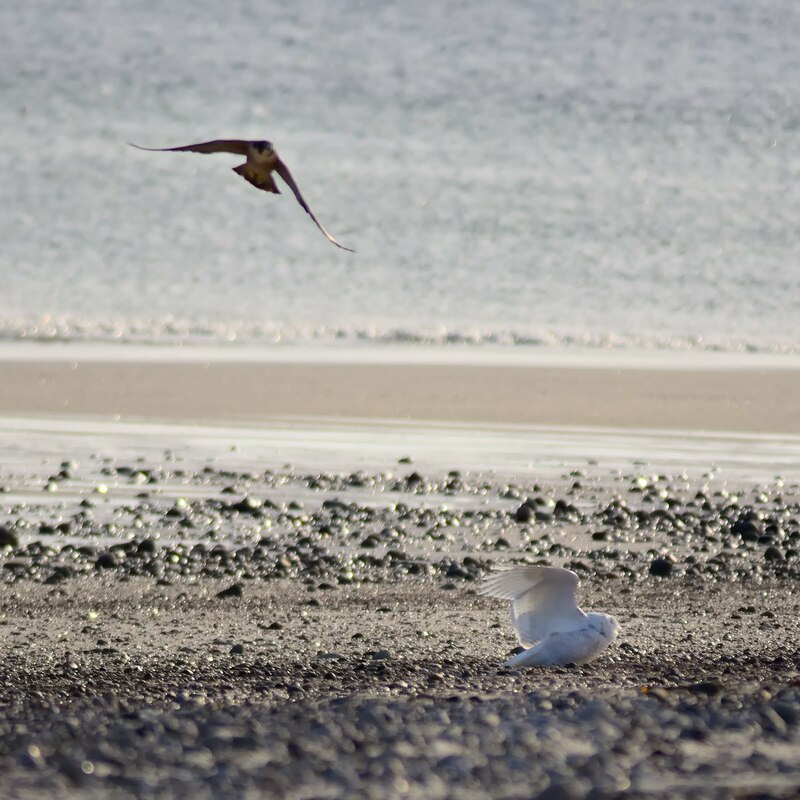 It flew a few hundred yards down the beach and then turned around and flew right back at us. It swooped about ten feet off the ground as it passed by. 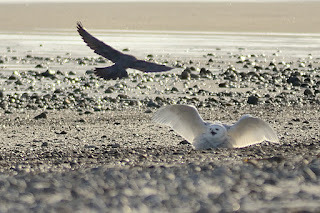 I was very fortunate to be able to make this image as the owl flew very fast. Seeing my image on tv was quite a thrill! I made sure to record it on DVR and then I watched it on the repeats later in the evening. I am glad that I sent in the photo. Hopefully the people who go will remember to treat the owls with respect. The owls need their space and their rest. Try to stay at least 50 feet or more away. 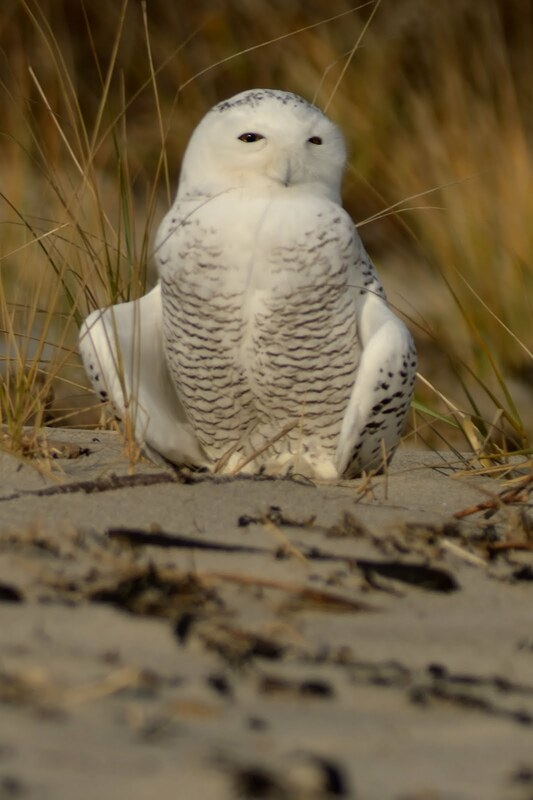 When approaching the owls, stay low and move slow! Too many people try to walk right up to the owls. Please care for the owls and be considerate of other photographers. On Saturday, I was fortunate to photograph a young snowy owl. It was perched on a post, looking quite striking. After a few minutes it flew away. 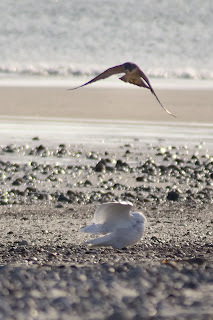 As it was flying, it was attacked by a peregrine falcon! The snowy owl was seriously outmatched in flying maneuverability, so it hit the deck as fast as possible. 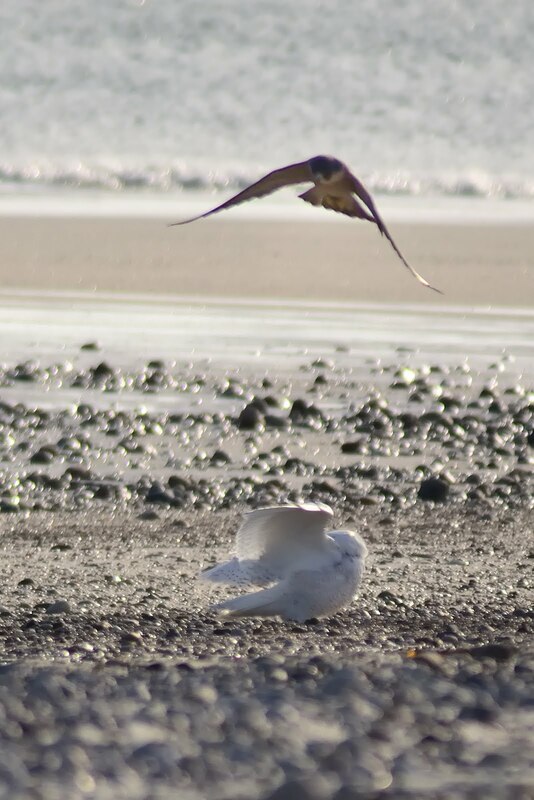 From the beach it defended itself from the falcon by raising its wings and trying to look as large as possible. The falcon swooped at the owl at least ten times. Each time the falcon attacked, the owl ducked. After the falcon passed, the owl seemingly taunted the falcon by puffing its chest out and flapping its wings in the direction of the falcon. I would have to declare a draw on the bout. While the falcon was clearly the aggressor, it never landed a strike. 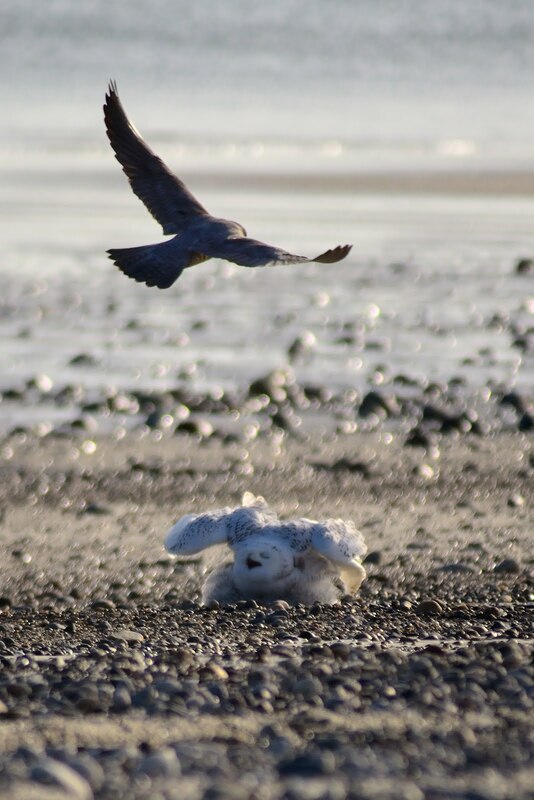 The owl successfully defended itself from the peregrine falcon. 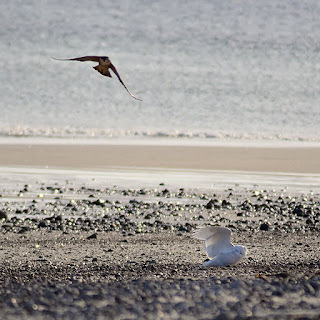 My other impression of the encounter came from watching the two birds fly. The falcon was obviously incredibly quick and maneuverable in the air. In comparison, it made the snowy owl, which is a very graceful glider, look like a clumsy oaf. It reminded me of what a battle between an F-15 and a WWII era bomber might look like. This was clearly a lightweight vs. heavyweight battle. Please be respectful of the owls and the other photographers. Saturday was very frenetic. There were a number of photographers and birders looking at the owls. Most kept their distance and did not pressure the birds. A few over zealous photographers kept getting too close. The owls need their space and their rest. Try to stay at least 50 feet or more away. When approaching the owls, stay low and move slow! Too many people try to walk right up to the owls. Please keep other photographers in mind and don't set up shop right in front of another photographer. Today, I watched a photographer step in front of another photographer who had been quietly and patiently watching the owl for more than two hours. Please care for the owls and be considerate of other photographers. 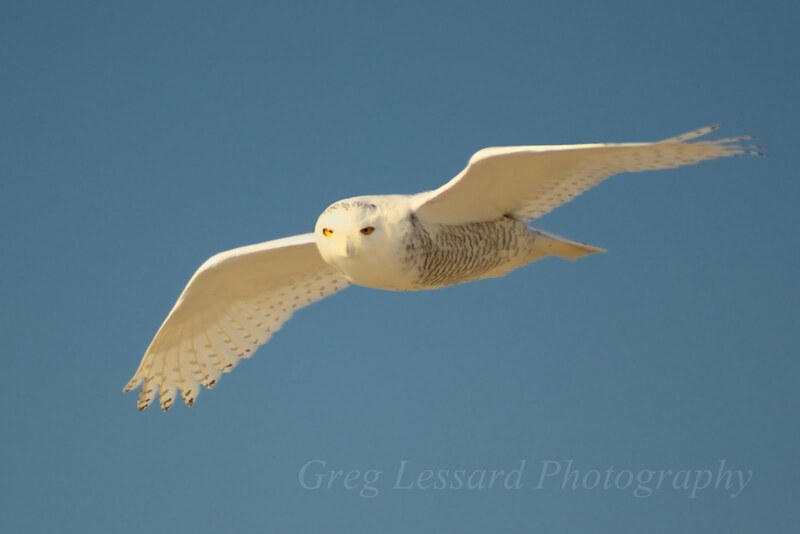 Here are two more images of the snowy owl that I saw yesterday. The first image shows the bird resting with its wings casually splayed out to the side. The owl spent nearly an hour in this position until a crow flew nearby. The second image shows the owl in a defensive crouch just after the crow flew by. The owl stayed in this crouch position for a little more than a minute. Then it stood up and walked around before settling back into its rest position. I was thrilled to see this owl in such a clear spot. Later in the morning it flew into some very thick ground cover, which made it very difficult to see, much less photograph. I quickened my pace. I kept telling myself not to get too excited. Birds often fly away before you get a chance to spot them. I could only hope that the owl would still be there when I arrived. My anticipation was growing. I was eager to see the owl. I was like a kid at Christmas waiting to see what was under the tree. Finally, I arrived and surprise, no bird. Disappointed, I decided to walk further on. After a quarter mile I spotted two photographers with giant lenses. I was getting excited again. They had to be photographing the owl, but I couldn’t see it. After a few hundred more yards I spotted what looked like a large white volley ball near the photographers. It had to be the owl. It was in some dune grasses and it seemed to be resting. Immediately, I went very close to the shore to give the owl as much space as possible. I had to pass the owl to get on the right side of the light. The last thing that I wanted to do was spook the owl and spoil the opportunity for the other photographers. I walked approximately 75 yards past the owl and approached the photographers while staying low to the ground. Setting up about ten feet behind the photographers, I made my first images about 50 yards from the owl. At this distance, even my 500mm lens was not long enough to make a great image of the very large bird. I quickly added my 1.4 teleconverter to gain 40% more focal length, effectively making my lens a 700mm lens. The teleconverter helped magnify the owl tremendously. One of the photographers waved me up to join them. The extra ten feet helped as well. For the next hour, I sat with two very experienced bird photographers. 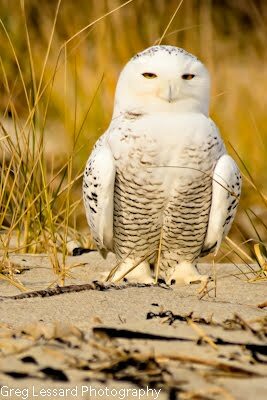 We intently watched the snowy owl. It barely moved. We were very excited when a crow buzzed by and caused the owl to go into a defensive crouch. Then the owl walked a few paces before settling down for another nap. Eventually the owl perked up and flew away. The three of us were thrilled to spend some time with such a magnificent bird. This month’s tip: Persistence pays off. Eventually, being in the right place will result in being there at the right time. 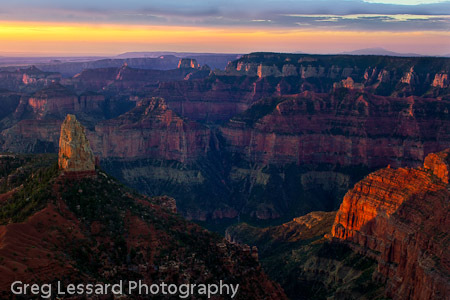 This summer I was fortunate to be able to photograph the North Rim of the Grand Canyon. 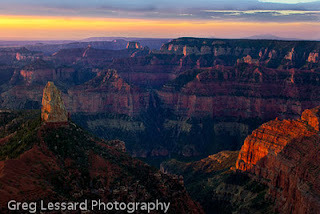 On my second sunrise I went to Point Imperial, the highest point on the Grand Canyon. Point Imperial is an amazing landscape with endless views of red sandstone mountains. Mount Hayden and its spire look like an ancient temple presiding over the canyon. The North Rim is a fantastic place to visit. The North Rim is not a desert landscape. In fact it is a mountain forest reminiscent of the Rockies of Wyoming and Montana. During my visit, the wildflowers were just starting to bloom. Thousands of lupine and indian paintbrush decorated the landscape in a glorious manner. The most bizarre surprise at the North Rim was the herd of beefalo that lived in the forests near the canyon. This herd is the descendants of a cattle and buffalo cross that was bred near the turn of the last century. Imagine buffalo with long steer like horns. I was thrilled to be there for this sunrise. A few people joined me on the edge of the canyon, but I didn't mind sharing this incredible view. The waves were pounding the coast of Acadia after a storm unsettled the sea. Ocean Drive was simply stunning. The pink granite coast stood in stark contrast to the azure sea. Each wave seemed bigger than the last. It was a fantastic fall day. 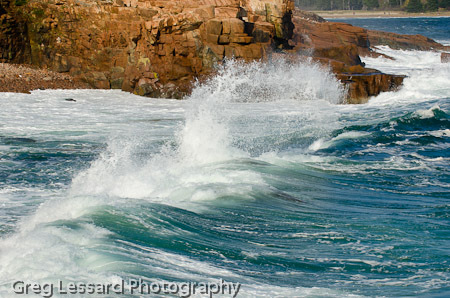 This composition was inspired by well known Acadia photographer Ed Elvidge. He created an amazing black and white of a wave crashing into the coast. I had shown his photo to some of the participants on the Acadia tour as an example of excellent photography. I was thrilled to have the opportunity to make my own image later that day. Crashing waves are simply mesmerizing. 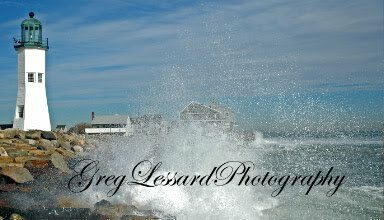 If we had the time, many of us could have spent the entire afternoon photographing the waves. The power of the sea is truly enchanting!